"It's hard to grasp the idea of no gender." I think the intention here was well meant, but the execution was filled with character inconsistencies, plot holes and a complete lack of understanding about the issues it was trying to address. 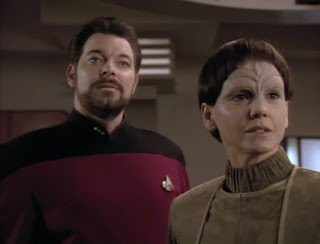 The structure of the episode was all a-plot, with the b-plot used only as a framing device to tell the story of an ill-fated romance between Riker and a genderless alien named Soren. The concept of the J'naii is kind of a fascinating one; a society that has evolved beyond binary gender is a neat idea. Doing a romance with a member of the crew is also a natural enough idea to work with that kind of neutral sexual identity. Having Riker, who has primarily been depicted going after very feminine and traditionally beautiful women, take a liking to a plain androgynous alien with a strong personality and kind nature is a lovely character choice for him. I think the romance came on a little fast, but such is the nature of episodic television. Unfortunately that’s really the only good aspect of character choices in this episode. I’m not going to be too mean, but character has always been a little… flexible in this series, with the crew occasionally dancing a fine line between good and bad. Moral choices are made with either a grin and a pat on the back, or a grim speech about the prime directive. Picard in particular had a major personality issue in this one when he scolded Riker about potentially ruining his career if he meddled with the affairs of the J'naii. He didn’t show any struggle emotionally about Riker’s plight, and while he did give Riker a chance to rescue Soren from her people, it felt almost like an afterthought of the writers. Let's add to that the strange new chauvinism from Worf. He has never articulated in such direct ways that kind of attitude towards women. While he has mentioned that mating with a human woman would be impossible, that they were too 'soft,' he has that opinion about most humans in general. I cannot imagine him feeling that someone like K'Ehleyr was in any way inferior, so his lines at poker and in Ten-Forward felt out of place and thrown in to reflect a dissenting point of view for the sake of conflict. Lastly, is Beverly’s explanation of gender duality. She paints a very binary, males are strong and women are pretty, portrait of a society that is supposed to be all inclusive and without prejudice, homophobia or bigotry. Perhaps Beverly’s inability to explain gender and sexual politics to Soren has to do with her own failed romance with a Trill in an earlier episode. I’m also a little disappointed in the costumes and the J'naii makeup. While it must’ve been difficult to create an androgynous look for the J’naii, I wish they had gone for something more interesting, with the idea of individuality and the blending of gender as more of the dress of the world. But perhaps the absolute intolerance shown in the episode towards anything gender-related was the point. But why did they have to all look exactly the same? It made the J'naii culture seem unbelievable. While my reaction to the episode was mostly negative, there were a few ideas that worked especially in the last act. For example, Soren’s speech was wonderful, and definitely focused on the issue the episode was struggling to get across. But to prove a point about why they didn’t quite get it, I’m going to play a little word game here. I’ve changed the following quote in a fundamental way. Without looking it up, do you know what I changed? "I am gay. I was born that way. I have had those feelings, those longings, all of my life. It is not unnatural. I am not sick because I feel this way. I do not need to be helped. I do not need to be cured. What I need, and what all of those who are like me need, is your understanding. And your compassion. We have not injured you in any way. And yet we are scorned and attacked. And all because we are different. What we do is no different from what you do. We talk and laugh. We complain about work. And we wonder about growing old. We talk about our families and we worry about the future. And we cry with each other when things seem hopeless. All of the loving things that you do with each other – that is what we do. And for that we are called misfits, and deviants and criminals. What right do you have to punish us? What right do you have to change us? What makes you think you can dictate how people love each other?" If you guessed that I changed a single word in the first sentence you’d be right (I substituted the words ‘a woman’ for the word ‘gay’). How much does that change the context of this already powerful speech? It shows that this episode had something important at its core, that this speech was probably the backbone of the creative process. I wonder what could’ve been if this wasn’t made in the nineties, and it had taken more of a chance with the material? More importantly, despite the flaws, there is a strong condemnation of the idea of brain-washing someone to conform to the cultural idea of normal. It is probably the only message not tainted by the inept way they handled the whole issue of sexuality. There is also a very powerful and mildly dark message about giving up on dreams, and learning to let go of the things we love when they are taken away from us. Of course, there will be no lasting repercussions for Riker. In fact, I doubt he will even be depressed about losing Soren in the next episode. I don't get why Riker asked Troi for permission to date Soren. They haven't been a couple for years. My only guess is that Soren was the first person he’d been with since Troi that he was serious about. I guess the Enterprise doesn't have Voyager's magical shuttle craft replicator, because for some reason Riker and Soren had to not only repair the shuttle, but use the same one that was damaged. There isn't an easy way to explain biology without getting into details not really suitable for an audience watching network television. I just wish they had been able to explain the J'naii reproductive cycle a little better. I mean, a show from the eighties (Alien Nation) managed to do it. Why couldn't they do it on Star Trek? The null-space idea was really cool, and it could've been utilized in a much bigger way as an episode-long plot device. So, why did Geordi suddenly have a beard? Soren: "The idea of gender: it is offensive to my people. You see, long ago, we had two sexes, as you do. But we evolved into a higher form. I don't mean to sound insulting, but on my planet, we have been taught that gender is... primitive." Riker: "Maybe so. But sometimes, there's a lot to be said for an experience that's 'primitive'." Soren: "Tell me about males. What is it makes you different from females?" Riker: "Snips and snails and puppy dog tails..."
Soren: "You have a dog's tail?" Riker: "Did it occur to you that she might like to stay the way she is?" Noor: "No, you don't understand. We have a very high success rate in treating deviants like this, and, without exception, they become happier people after their treatment, and grateful that we care enough to cure them. You see, Commander, on this world, everyone 'wants' to be normal." Riker: "Soren... I love you." Not a complete dud, but painfully tone-deaf and mostly a disappointment for an episode as important as this one should have been. 2 out of 4 not so magical shuttlecrafts. This is undoubtedly a not-great episode and it didn't age well. I thought Melinda Culea did a good job with her character, but the fact that it was "her" character was a problem for me -- Next Gen started with an interesting idea, exploring what a culture with no gender would be like, but then they didn't really do that. The whole story was about the fact that some of them were oppressed because they secretly had gender, and of course, Soren had to be straight. It might have been interesting if she had been attracted to, say, Beverly or Deanna instead. It didn't help that they decided to make the J'naii so neutral looking and plain and made them wear ugly onesies. Or that the gender-neutral pronoun couldn't "translate." Or that the only other J'naii with speaking parts were clearly played by women. Oh, well. I totally agree that Soren's speech was deeply moving and I'm sure you're right that it was supposed to be the backbone of the episode. At the time, even choosing this subject was probably seen as daring and progressive. Watching it again now, it mostly shows how much the 24th century in this show is rooted in the late 20th century. It starts with Picard's first line, introducing the new aliens. I'd hope in the 24th century, the androgynous nature of an intelligent species wouldn't be the first (and only) thing you'd mention when describing them. After that, of course, every time the gender matter is brought up the show brings to our attention how little society seems to have progressed since the early 1990's. Still, I can't really dislike this episode. Even in its failure, it's part of what TNG tried to be. I prefer a Star Trek that tries to address such issues to one that doesn't, even if it sometimes fails. Thinking about what could have made this episode better, I think they probably should have focused on the J'naii society a lot more. They clearly intended them to be a mirror to the intolerance found in our own society. In the "court" scene this actually worked, pointing out our own intolerance by showing us the intolerant J'naii point of view. All those other scenes trying to show the Federation side of it fail because of the reasons mentioned earlier. The writers clearly need a bit more distance, they need the alien species mirror, to address this subject. If they had realised that and had set the episode mostly in J'naii society, I think it could have worked. Compare the way season 4's First Contact addressed xenophobia.